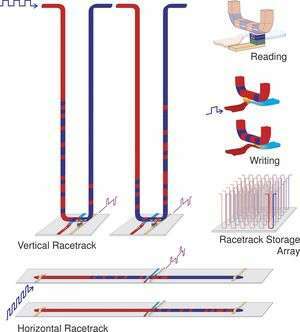 Within the next ten years, racetrack memory, so named because the data "races" around the wire "track," could lead to solid state electronic devices – with no moving parts, and therefore more durable – capable of holding far more data in the same amount of space than is possible today. For example, this technology could enable a handheld device such as an mp3 player to store around 500,000 songs or around 3,500 movies – 100 times more than is possible today – with far lower cost and power consumption. The devices would not only store vastly more information in the same space, but also require much less power and generate much less heat, and be practically unbreakable; the result: massive amounts of personal storage that could run on a single battery for weeks at a time and last for decades. "It has been an exciting adventure to have been involved with research into metal spintronics since its inception almost 20 years ago with our work on spin-valve structures," said Dr. Parkin. "The combination of extraordinarily interesting physics and spintronic materials engineering, one atomic layer at a time, continues to be highly challenging and very rewarding. The promise of racetrack memory - for example, the ability to carry massive amounts of information in your pocket - could unleash creativity leading to devices and applications that nobody has imagined yet." IBM is no stranger to creating entirely new markets that spring from exploratory research such as this. Just a few of the many game-changers invented at IBM Research include the memory chip, the hard disk drive and the relational database. Currently, there are two main ways to store digital information: solid state random access flash memory, commonly used in devices such as mobile phones, music players and digital cameras, and the magnetic hard disk drive, commonly used in desktop and laptop computers and some handheld devices. While both classes of storage devices are evolving at a very rapid pace, the cost of storing a single data bit in a hard disk drive remains approximately 100 times cheaper than in flash memory. While the low cost of the hard disk drive is very attractive, these devices are intrinsically slower and, with many moving parts, have mechanical reliability issues not present in flash technologies. Flash memory, however, has its own drawbacks – while it is fast to read data, it is slow to write data, and it, too, has a finite lifespan. Flash, can be reused only a few thousands of times because it eventually breaks because it is slightly damaged by each use or "rewrite." Since racetrack memory has no moving parts, and, rather than storing data as ensemble of electronic charge, uses the "spin" of the electron to store data, it has no wear-out mechanism and so can be rewritten endlessly without any wear and tear. In the review paper that describes the fundamentals of racetrack, "Magnetic Domain-Wall Racetrack Memory," Dr. Parkin and colleagues describe the use of magnetic domains to store information in columns of magnetic material (the "racetracks") arranged perpendicularly or horizontally on the surface of a silicon wafer. Magnetic domain walls are then formed within the columns delineating regions magnetized in opposite directions (e.g. up or down) along a racetrack. Each domain has a "head" (positive or north pole) and a "tail" (negative or south pole). Successive domain walls along the racetrack alternate between "head to head" and "tail to tail" configurations. The spacing between consecutive domain walls (that is, the bit length) is controlled by pinning sites fabricated along the racetrack. In their paper, the scientists describe their use of horizontal permalloy nanowires to demonstrate the successive creation, motion and detection of domain walls by using sequences of properly timed nanosecond long spin-polarized current pulses. The cycle time for the writing and shifting of the domain walls is a few tens of nanoseconds. These results illustrate the basic concept of a magnetic shift register relying on the phenomenon of spin momentum transfer to move series of closely spaced domain walls – an entirely new take on the decades-old concept of storing information in movable domain walls. Ultimately, the researchers expect the racetrack to move into the third dimension (3D) with the construction of a novel 3D racetrack memory device, a paradigm shift from traditional two-dimensional arrays of transistors and magnetic bits found in silicon-based microelectronic devices and hard disk drives. By moving into the third dimension, racetrack memory stands to open new possibilities for developing less expensive, faster devices because it is not dependant on miniaturization as dictated by Moore’s Law. Dr. Parkin’s advances with racetrack memory build on his prior accomplishments in memory technologies including the spin valve, and Magnetic Tunnel Junctions (MTJs) and breakthroughs in magnetic RAM (MRAM). Racetrack memory encompasses the most recent advances in this realm, the field of metal spintronics. The spin-valve read head enabled a thousand-fold increase in the storage capacity of the hard disk drive in the past decade; the MTJ is in the process of supplanting the spin-valve because of its higher signal. MTJs also form the basis of modern MRAM, in which the magnetic moment of one electrode is used to store a data bit. Whereas MRAM uses a single MTJ element to store and read one bit, and hard disk drives use a single spin-valve or MTJ sensing element to read the approximately 100 GB of data in a modern drive, racetrack memory uses one sensing device to read 10 to 100 bits. Further understanding of the interaction of spin polarized current with magnetic moments is essential. "For example, this might allow a reduction in the current density needed to manipulate or move domain walls," said Dr. Parkin. "This would drop the power needed for racetrack further, and enable even lower power devices. We expect that our exploration of a wide variety of materials and structures will provide new insight into domain wall dynamics driven by current, making possible domain wall based memory and even logic devices that were previously inconceivable. It will not only change the way we look at storage, but the way we look at processing information. We're moving into a world that is more data-centric than computing-centric." Great concept but old idea. Only need to be concerned with a single point failure, heat, stray magnetics, materials quality, cost, yield and bandwidth to name a few. Your totally correct. This guy is wasting his life on something already abandoned. What a complete loser. It's people like you Holoman that the world needs more of to help point out these things. I'm sure you have much better ideas for cutting edge research than this guy. You should contact him and explain your ideas. We can't judge if "nanotechnology" will sufficiently reduce the size and increase the speed of this 3D dream, but there is so much competition being worked on using non-magnetic technologies (e.g. optical and quantum mechanical properties of solids) that skepticism is justified. This is one of the worst written articles I have seen. Please, just include a simple drawing, for a simple concept. With CRC & redundancy, especially at higher levels of the storage system, a lot of these concepts become obsolete. For example, you'd never find a server with a single hard drive (or even mirrored hard drive) in it anymore (heck most high-available servers don't have hard drives on board anyways). And today's hard drives dissipate a ton of heat. Huge voltage from huge current density over a long nanowire. Bust.